Corbett County Resort provides rooms with room heater. 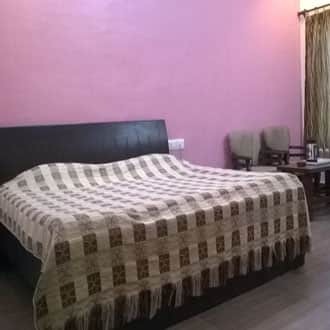 This property in Ramnagar is situated at a distance of 11 km from Ramnagar Railway Station.This resort in Ramnagar offers well furnished rooms with balconies. Some of the conveniences include tea/coffee maker, television, hair-dryer and attached bathroom with hot and cold water supply. This property has a separate dining area available and provides bonfire with music. It also arranges safari tours to Jim Corbett National Park.Corbett County Resort organizes nature treks. This resort in Ramnagar is located at a distance of 10 km from Garhwal Moter Users Bus Stand and 91 km from Pantnagar Airport. Some of the attractions include Garjia Temple (0.3 km), Jim Corbett National Park (95 km), Gurudwara (37 km) and Kosi River (4 km). The A/c deluxe rooms are peaceful and offer soothing ambience. Relax and unwind in the spacious rooms and have a comfortable stay. In-room amenities include a television set, makeup mirror, cosy bed, room heater, desk, attached bathroom and many more comforts. Please do not book this hotel if you are visiting Jim Corbett national park. All the rooms have some issue or the other. One did not have the ac working, another did not have the toilet tube working, the toilet flush does not work. I categorically followed up with the manager to keep the room ready(since i would be coming from Kausani after a 6 hr travel). On arrival, i was given a room where the light did not work, the ceiling fan had prob and another room which did not have a working ac. I had to wait 3 hrs before the electrician came and started fixing. On the day of checkout, i asked for bill but the manager said that "the bill book had run out of pages" and he had ordered for a new one. Hence he would not be able to provide a bill. I then asked for a written receipt on his hotel's letterhead. He said that the letterhead had too finished. Finally he wrote on a blank piece of paper and made the room service boy sign on it, instead of him. He promised me that he would send it by post within 3 days. Such was his assurance that I have still not received it after 1 month. The hotel is situated away from the min road and one would need his/her personal car to go there. The hotel takes advantage of this and has prepared an overpriced menu card. The taste of the food is not even half the value of the price that they charge. Overall the room service is also extremely poor and be prepared to wit for 2 hrs if you wish to order food. The only positive about this so called resort is its location which is quite close to the Bijrani gate and the Kosi river. The resort area is more or less okay too. ROOMS: The rooms at this resort are in a sorry state. We were supposed to check-in at noon. However, it wasn't untill 2.45 PM that we got the rooms. Two different versions were presented to us for the room not being ready - First, that it was occupied by the hotel staff the night before since the occupancy was low and secondly, that the room was occupied by guests the night before who ransacked the room and the surrounding area under the influence of alcohol. The cupboards were unclean with cobwebs all around and in one of the rooms it also had dirty linen from another room. The washrooms were a bit smelly but okay. The mattresses used were very hard in texture. Lacked basic toiletries and amenities. One of the rooms had a room heater the other didnt. One room had a telephone but not a connection and the other room didnt even have that. Basic lighting inside the room was missing apart from a solitary CFL bulb. FOOD: Not at all close to being okay. The lunch timings were till 3 PM. We had placed the order after checking in (around 1.15 PM), the lunch was served at 4 PM. Most of the items mentioned in the menu weren't available and the staff who took the order was least interested in cooperating. We were told that we had to do with whatever was available which included dal fry, mix veggies and chapatis. The tandoor was a special one manufactured only at the resort - it only functioned at night. It was only later after much haggling that they agreed to go to the market and buy the required items. When the food was finally prepared, it was already pre-served and we were informed later that the food has already been served. What we saw was flies sitting on the food served. We somehow managed to have some part of the food since it was already 4 PM. When we asked for mineral water, they didnt event have that and had to go an purchase it from the market. The food itself was a mix of bland to too spicy. STAFF & SERVICE: Unprofessional, unapologetic, uncooperative and rude. Right at the time we checked in, we had to repeatedly ask the staff to get our luggage from our car to the rooms. Then when we went to speak to the manager-in-charge about the experience we faced since we checked in, he appeared to listen to is in the beginning but slowly went into a denial mode. On asking about cancellation, he didn't have a clue at all. So he did the most frivolous thing. He called up the owner of the resort and told him that since a member in our group was ill, we wanted to check-out. When we approached the reservation forum to cancel our booking and request for a refund, we were told that since the owner has given a different version, it couldn't be done. When we finally decided to check out, we asked the staff to help us load the luggage, the staff was nowhere to be found. While two of us were away for getting some necessities from the market, one of the staff even switched off the main switches to the rooms allotted to us. Our better halves were in complete disarray and had to scream to them to say that they were still in the room. The manager tried to cover it up by saying that there was a load shedding and hence the lights went out. If such was the case then firstly, how did the other rooms in the resort have electricity and secondly, had the load shedding actually taken place, the backup generator would have been switched on. The manager on his behalf tried to cover up for all the mess and presented a different version of the story to the owner to save his staff. We had to check out immediately to save ourselves from further trauma. We had to let go off the amount spent on booking the package since they weren't ready to refund and we couldn't stay a minute longer. A stay at this resort is NOT RECOMMENDED at all. An excellent place to stay with the family. A resort with nice and polite staff. I stayed in a family room which was more spacious than a four star hotel room.The rooms were very clean and had all the amenities required. Delicious and fresh food was served. A peaceful place located near the Girija devi temple ,one of the famous attractions. The Bijrani gate of Jim Corbett is also located near the resort. The resort is at a walking distance from the Kosi river. The resort also has a games room and a bonfire area which is a comfort in this season (winter). In a nutshell this place is more than worth for money. This Resort Is Only Name Resort Even They Dont Have Phone In Room So That If Guest Need Something they can call . Every time if you have to place any Order you have to shout out space is very small nothing to do in this Resort . Rooms on the first floor have better views. Family lodges are more comfortable.